If you have Scottish ancestors or an interest in Scottish research, then this Road Show is NOT to be missed. 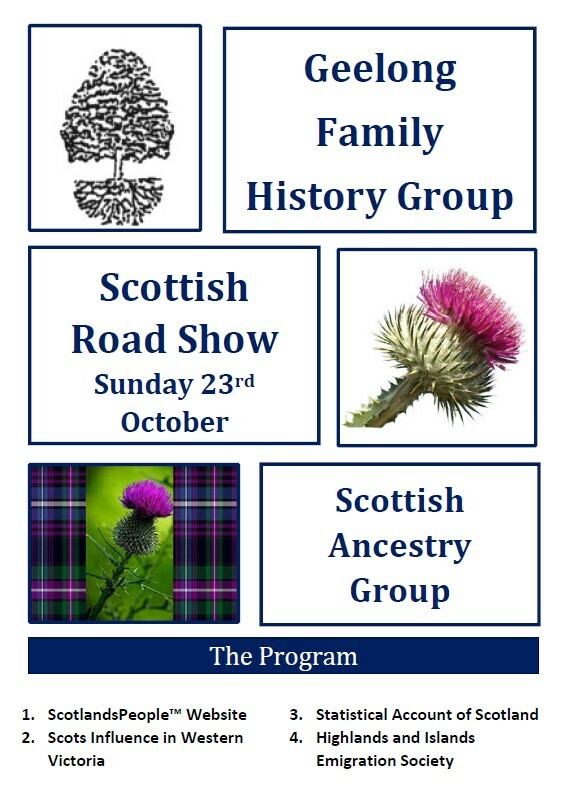 The Road Show has been organised by the Geelong Family History with support from the Scottish Ancestry Group and their speakers. The Road Show is being held in the meeting room of the Waurn Ponds Libary. Even if you’re not a member of the Geelong Family History Group, the Scottish Ancestry Group, or the Genealogical Society of Victoria, this full day of brilliant speakers and information will only cost you $25.00 for the whole day which includes morning and afternoon tea. And if you are a member of one of the groups mentioned, then it will cost you just $20.00. Download the brochure for all the details and the booking form.